OTTAWA -- Scott Brison is quitting a political career he loves to spend more time with a cherished family that politics made possible. 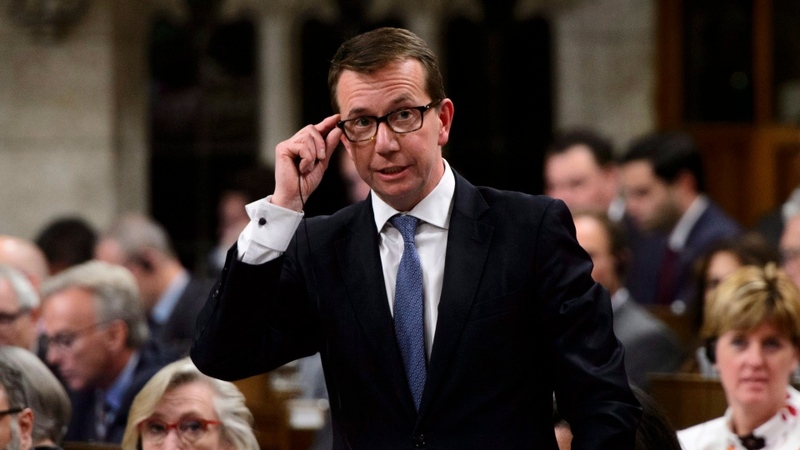 After 22 years representing the Nova Scotia riding of Kings-Hants -- initially as a Progressive Conservative MP before jumping to the Liberals in 2003 -- Brison told The Canadian Press it's time for a change. He's decided not to seek re-election this fall. Trudeau said he wishes Brison well. "I want to recognize the extraordinary service that Scott Brison has offered to Canadians for 22 years as a member of Parliament, as a minister in multiple governments, and as someone who has every day dedicated himself to this country, to his community, and to building a better future for all," Trudeau said after the announcement. "As a parent, I know, like so many know, the difficult challenge of balancing a demanding job with time spent with family, so I fully respect his decision but we're going to miss him tremendously." But above all else, he said the decision is about -- and was made together with -- his family, husband Maxime St. Pierre and their four-year-old twin daughters Rose and Claire. He denied that his decision to quit politics is in any way related to the current controversy surrounding his role in the suspension of Vice-Admiral Mark Norman, the military's second-in-command who has been charged with leaking cabinet secrets. Defence lawyers are expected to make Brison a star witness when the case goes to trial in August -- just weeks before this year's election campaign officially starts.